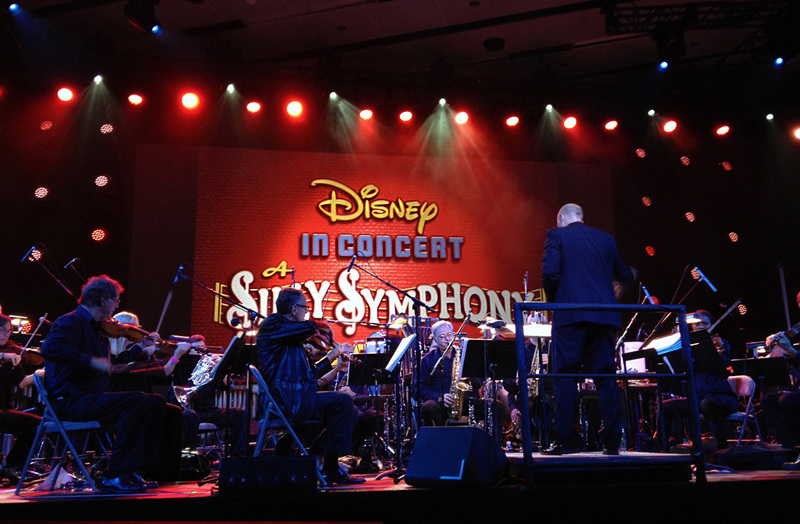 ANAHEIM, Calif. - An estimated 4,000 Disney fans got to see six classic Silly Symphony cartoons with live musical accompaniment at the D23 Expo Sunday at the Anaheim Convention Center. D23 organizers wisely scheduled two identical 70-minute concerts (at 11 a.m. and 2 p.m.) to accommodate the anticipated crowds. 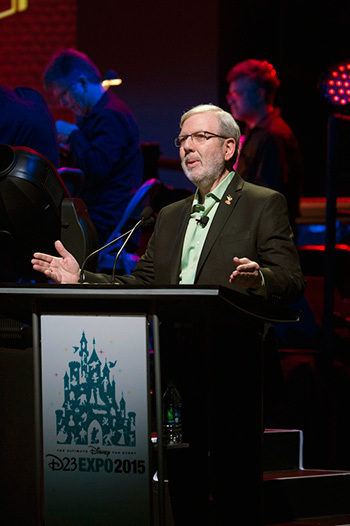 Film historian and Disney expert Leonard Maltin hosted both, which featured a 32-piece orchestra conducted by Steven Allen Fox. 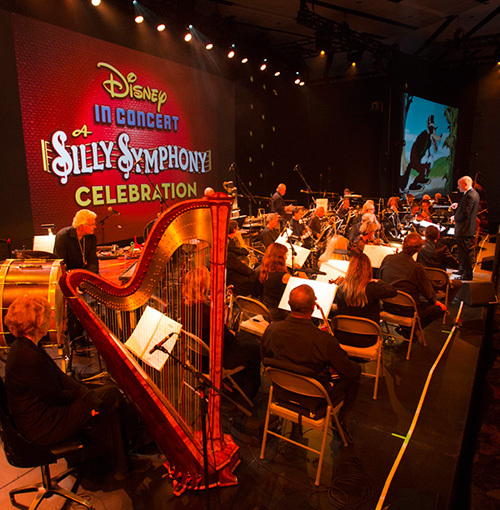 The concert opened with an overture in which the music of Mother Goose Goes Hollywood (1938, scored by Edward Plumb) was performed to filmmaker Les Perkins' newly created montage of clips from all 75 Silly Symphony shorts from 1929 to 1939. It was a perfect opener, partly jazzy and partly classical in nature, but with funny, silly sound effects (including bird calls) all brilliantly realized by the top-tier orchestra. Maltin introduced them as "the cream of L.A. studio musicians." Maltin proved a warm and engaging host, offering historical tidbits and introducing vintage clips of Walt Disney himself (from his long-running TV series) talking about the role and importance of music in the series. 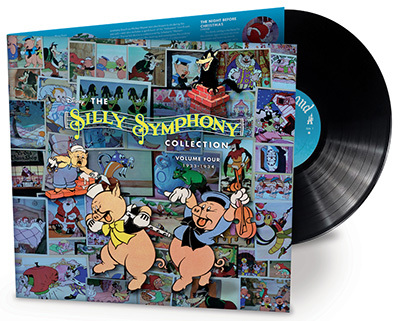 Maltin pointed out that Disney's first musical director, Carl W. Stalling – who would later achieve greater fame as composer of hundreds of Warner Bros. cartoons – came up with the idea of Silly Symphonies, where music would be "the driving force of the cartoon." Just 10 musicians played the score for the first Silly Symphony called Skeleton Dance (1929, scored by Stalling), in which skeletons cavort in a cemetery until dawn. 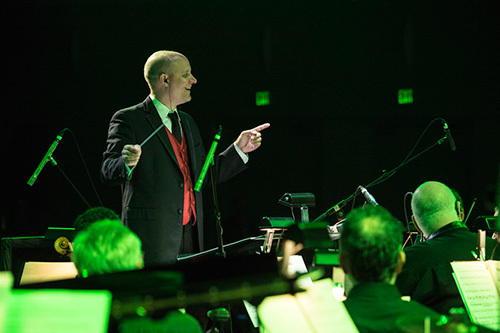 Alexander Rannie, a composer and Disney music expert who restored all these scores for concert performance, said in a pre-concert interview that the original scores (still in Disney's music library) indicated that 10 musicians were likely all Stalling had. Whistles and a wind machine were part of the music-making in this short. A highlight of the afternoon was The Three Little Pigs (1933, scored by Churchill), with Disney's first big song hit "Who's Afraid of the Big Bad Wolf." Here, the original vocal tracks were drawn from the cartoon but all other sounds were performed by the orchestra – including the Wolf's knocking on the pigs' doors, done on the actual wood prop used for the original recording more than 80 years ago. Maltin introduced this classic with an amusing, black-and-white re-creation (again, from the Disney TV show) of Disney, songwriter Churchill and the animators coming up with the song. Maltin noted that "Who's Afraid of the Big Bad Wolf" took on a much greater significance than just a cartoon song, as it became "an anthem for people experiencing the effects of the Great Depression... a defiance song" that voiced optimism in the face of very difficult times for Americans. The clip introducing The Old Mill (1937, scored by Leigh Harline) had Disney himself explaining that this was "an experimental short subject" designed to help animators find solutions to problems involving depictions of nature including rain and lightning, in advance of his first feature-length animated production, Snow White and the Seven Dwarfs. It also marked the first use of the multi-plane camera to "give a dimensional quality, a feeling of space," Disney said. The Old Mill, which also won an Oscar for best animated short, is a nine-minute masterpiece without any humans or familiar characters. It tells the story of an abandoned windmill inhabited by birds, mice and bats, and what happens one night when a damaging thunderstorm occurs. For this one, the percussion section had a field day, creating sounds of frogs, grasshoppers and fireflies. The Ugly Ducking (1939, scored by Albert Hay Malotte) offered a heart-warming moment in the concert, but the most exciting moments were saved for last. The concert concluded with Music Land (1935, scored by Harline), another classic that depicted a battle between the "Land of Symphony" and the "Isle of Jazz," a Romeo-and-Juliet tale of a violin and a saxophone who meet and fall in love despite the opposition of their parents from different lands. The orchestra rose to the challenge and earned a standing ovation for their efforts. 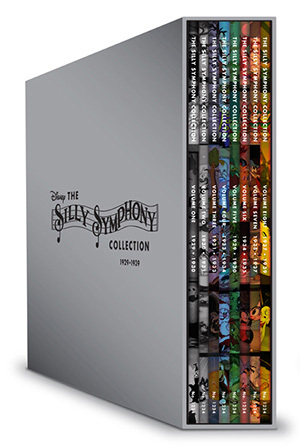 Attendees were able to take their musical memories home with them, because premiering for sale at the D23 Expo was The Silly Symphony Collection, a 16-LP box set containing, according to Walt Disney Records, "the complete restored soundtracks from all 75 Silly Symphony shorts," more than eight hours of music in all.